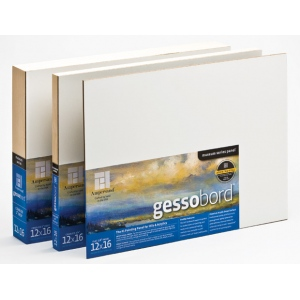 * Gessobord is available with our innovative and elegant cradles that provide extra support and presentation all in one. * The New DEEP Cradle panels come with 2" birch plywood strips that are attached flush with the back edge of each panel. * Our original cradled panels come with the thinner 3/4" birch plywood strips and can be framed like a standard size canvas or can be hung directly on the wall without additional framing. * The plywood sides can be stained, painted, gessoed, waxed or left unfinished to customize and enhance your work. * Both cradle versions can either be used to paint on directly or as supports on which to mount watercolor papers, photographs, fabrics and prints. * The cradled panels will save you valuable painting time, as well as framing and carpentry costs!